After waking in the morning most of us head straight to the bathroom. When we come home from work we often like to relax with a shower. The bathroom is one of the most commonly used rooms in the house, and its design should reflect this with a calm and relaxing décor. Having a beautiful bathroom design can also make your guests feel welcome, and should portray strong interior decoration features to reflect who you are as a person. While bathrooms should be visually appealing, making the visitor feel comfortable and their needs catered for, the industrial bathroom can be a fantastic room in which to be both functional and creative, and explore new ideas! If you’re in a vintage mood why not grunge it up with some textures like stone, wood or brick. Or fancy it up a bit to make a bright and classy bathroom with some marble, white tiles or metallic finishes. 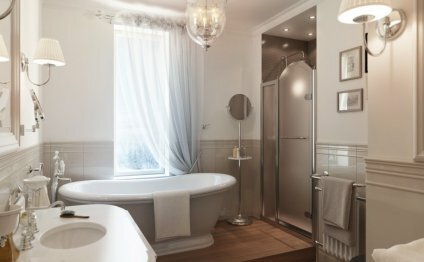 Certain bathroom ornaments can also help to heighten your bathroom theme, like candles, statues or unique towel holders. Of course before embarking on a bathroom remodelling, it’s important to plan well in advance to make sure you have a complete list of tasks for your plumber. Color combinations are an important consideration when exploring a creative bathroom idea, as they help set the mood in the bathroom. Another feature to consider is the bathroom mirror. If you have a small bathroom, a large mirror can help expand the space by reflecting light and creating an optical illusion of spaciousness. Today we’ve gathered 10 Extremely Creative Bathroom Design Ideas, ranging from cheerful and bright bathrooms, and modern state of the art, too dark grunge themed bathroom ideas. This is a beautiful bright bathroom, set with a decorative black and white pattern tiles, clean and spacious look. Set with wooden textures and mostly white décor. The large window brings in lots of light to make this bathroom bright and cheerful. This a fantastically grungy bathroom, detailed with textured elements while still maintaining an elegance. The ceiling is finished in a textured Venetian plaster, and the decorative details in the plaster make a beautiful design statement and add sophistication to the more rustic qualities. Floating Mascarello granite countertop and dazzling mica and quartz in the stone, complement the simpler elements in the space. The hand-forged candlestick sconces and romantic ironwork ceiling fixture, bring about a colonial ambiance, perfect for this powder room renaissance. Another grunge themed bathroom, set with earthy tones and textures, the two designers went for a Concrete and Grass theme for the bathroom. Some people may not like the cold and run down bathroom design while for others it might be appealing. Very interesting take on a bathroom none the less.